Google has announced some new search numbers, and the new numbers are a pretty big jump. Google now does trillions of searches per year. I did ask for clarification on Google.com and whether it would also include searches done on the country Google sites, such as Google.ca, Google.fr, Google.co.uk etc. And Google confirmed with me that this is a global stat. So the reference to Google.com seems to rather be addressing that these stats don’t include “Google powered search” properties, such as Yahoo etc. This is a huge update from their last public statement on searches from back in 2012 when they did 100 billion searches per month. For those struggling with the math, 100 billion = 0.1 trillion, or 1000 billion in a trillion. As for the 50% mobile, previously Google said just over a year ago that there were ten countries had more than 50% mobile, but late last year they quietly confirmed they are seeing 50% mobile worldwide. 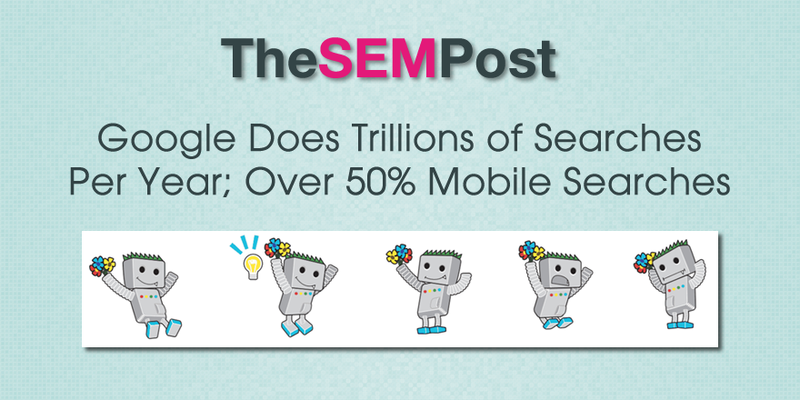 But when you factor in that there are trillions of mobile searches, it definitely puts things into perspective of exactly how important mobile is to Google.